Catalogs > CEE HydroSystems > CEE ECHO? Compact This dual frequency echosounder offers integrated data management and internal power at around 3.5 kg (7.7 lbs) Rugged Built into a robust Pelican case the CEE ECHO has been engineered for use in vessels big or small. Suitable for temporary use in small open boats or long term installation on a dedicated survey vessel. 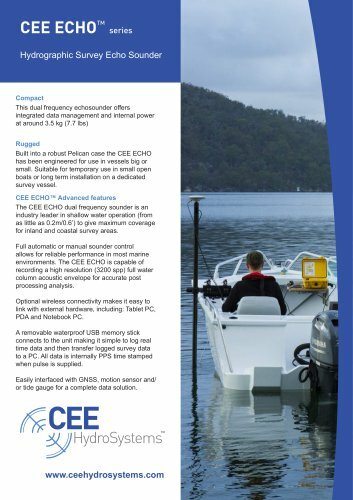 CEE ECHO™ Advanced features The CEE ECHO dual frequency sounder is an industry leader in shallow water operation (from as little as 0.2m/0.6’) to give maximum coverage for inland and coastal survey areas. Full automatic or manual sounder control allows for reliable performance in most marine environments. The CEE ECHO is capable of recording a high resolution (3200 spp) full water column acoustic envelope for accurate post processing analysis. Optional wireless connectivity makes it easy to link with external hardware, including: Tablet PC, PDA and Notebook PC. A removable waterproof USB memory stick connects to the unit making it simple to log real time data and then transfer logged survey data to a PC. All data is internally PPS time stamped when pulse is supplied. Easily interfaced with GNSS, motion sensor and/ or tide gauge for a complete data solution.